Here’s some help with the confused mess that is the anti-fluoride propaganda campaign. 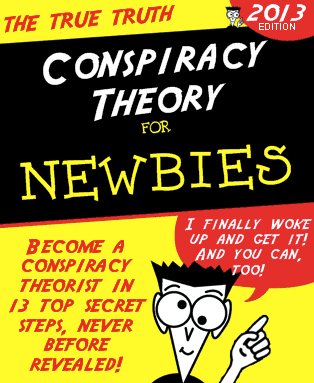 First, there’s a great blog, Conspiracy Check. The Anti-F campaign in March in Oakland CA is taken to task here, and provides some insight into the disinformation of the anti-Fers. From Conspiracy Check’s post “What is a Conspiracy Theory”. Click on pic to take you there. More importantly, I found a PDF journal article that discusses anti-fluoridation literature and dissects the crazy misinformation and tactics of the anti-F conspiracy. It goes for about 12 pages so it’s fairly comprehensive but it isn’t a hard read. It would be great to send to public officials to make them aware of the dodgy claims of anti-Fers. The article is Open Access, which means it can reposted in its entirety and distributed at will, but the link below does not require any login and the link should go to the pdf itself. Background: The addition of the chemical fluorine to the water supply, called water fluoridation, reduces dental caries by making teeth more resistant to demineralisation and more likely to remineralise when initially decayed. This process has been implemented in more than 30 countries around the world, is cost-effective and has been shown to be efficacious in preventing decay across a person’s lifespan. However, attempts to expand this major public health achievement in line with Australia’s National Oral Health Plan 2004–2013 are almost universally met with considerable resistance from opponents of water fluoridation, who engage in coordinated campaigns to portray water fluoridation as ineffective and highly dangerous. Discussion: Water fluoridation opponents employ multiple techniques to try and undermine the scientifically established effectiveness of water fluoridation. The materials they use are often based on Internet resources or published books that present a highly misleading picture of water fluoridation. These materials are used to sway public and political opinion to the detriment of public health. Despite an extensive body of literature, both studies and results within studies are often selectively reported, giving a biased portrayal of water fluoridation effectiveness. Positive findings are downplayed or trivialised and the population implications of these findings misinterpreted. Ecological comparisons are sometimes used to support spurious conclusions. Opponents of water fluoridation frequently repeat that water fluoridation is associated with adverse health effects and studies are selectively picked from the extensive literature to convey only claimed adverse findings related to water fluoridation. Techniques such as “the big lie” and innuendo are used to associate water fluoridation with health and environmental disasters, without factual support. Half-truths are presented, fallacious statements reiterated, and attempts are made to bamboozle the public with a large list of claims and quotes often with little scientific basis. Ultimately, attempts are made to discredit and slander scientists and various health organisations that support water fluoridation. Summary: Water fluoridation is an important public health initiative that has been found to be safe and effective. Nonetheless, the implementation of water fluoridation is still regularly interrupted by a relatively small group of individuals who use misinformation and rhetoric to induce doubts in the minds of the public and government officials. It is important that public health officials are aware of these tactics so that they can better counter their negative effect.